These 21st Birthday Personalized T-Shirts say it all. It's my birthday so Buy Me a Drink! What better way to have a lot of fun on your 21st birthday and keep your wallet full. Our Buy Me A Drink Personalized Shirt is Available on our premium white 100% cotton Personalized T-Shirt, machine washable in adult sizes S-3XL. Also available in Ash Gray. 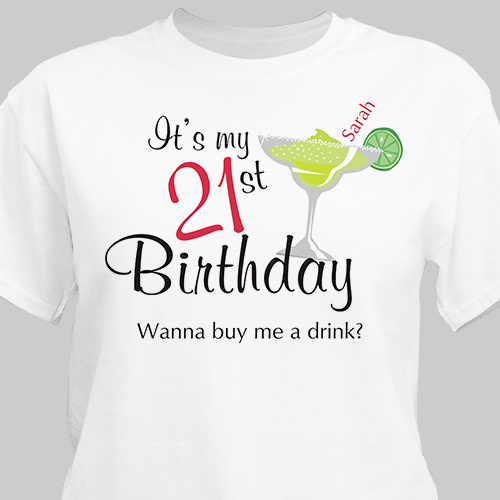 Personalize your 21st Birthday T-Shirt with any name. the newly turned 21 year old LOVED their shirts!! my daughter and her roommate LOVED their shirts!! !